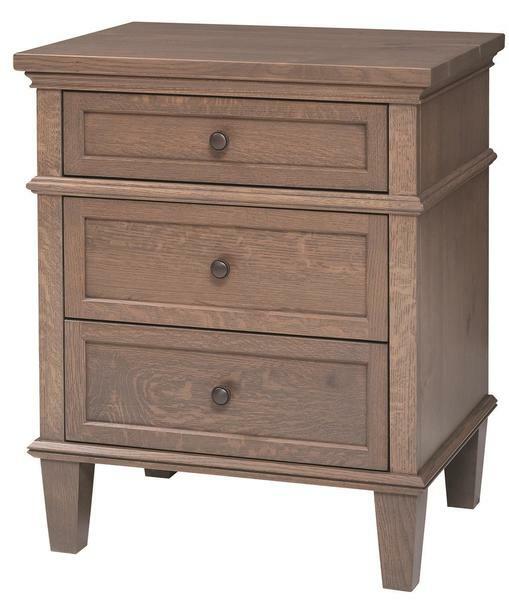 The Amish Rockport Three Drawer Nightstand offers convenient bedside storage as well as a beautiful display of Amish furniture. Shown here in a two tone design using brown maple and cherry wood, this solid wood bedroom furniture provides style and function. Place your lamp and alarm clock on the Rockport as well as some family photos. Amish furniture offers lots of attractive qualities, with customizable options being one of them. You select the wood and stain for your bedroom nightstands and consider adding soft close slides for drawers that practically close themselves. Always consider the height of your bed and how much storage you are looking for when shopping for bedroom nightstands. The Rockport offers three spacious drawers for your reading materials, glasses, remotes and more. Reduce trips to the bathroom in the middle of the night with items you need conveniently stored nearby. This bedroom furniture is made in America with the finest solid hardwoods. Enjoy our Shop the Look option to explore complete bedroom scenes in the style you love.